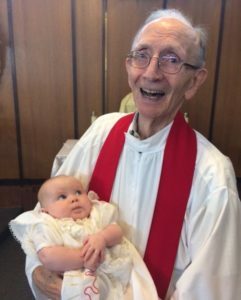 Columban missionary Fr John Marley explains how the baptism of baby Mae provides an example of four generations of one family combining to hand on the Faith over a period of 67 years and a distance of more than 3,000 miles. On 3 November 2018, I baptised Mae Olivia Conroy, aged four months, in St Columban’s chapel in Bristol, Rhode Island. Her parents, Lauren Coombes and Patrick Conroy, brought her all the way from their home in New York, because I had baptised her mother as a baby in Castleknock, Ireland, in 1982. 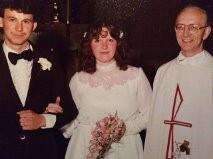 Not only that, but I had officiated at the wedding of Lauren’s parents, baby Mae’s grandparents, Roisin Kelly and Derek Coombes in 1980 at the parish of Christ the King in Cabra, Dublin. 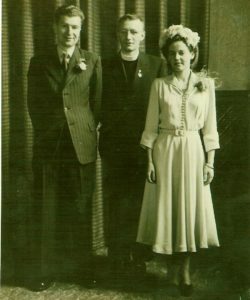 As if that were not enough, on 13 August 1951, as a newly ordained priest I had officiated at the wedding of Roisin’s parents, baby Mae’s great grandparents, John Kelly and Pauline Parnell, in the Pro Cathedral, Dublin, Ireland. 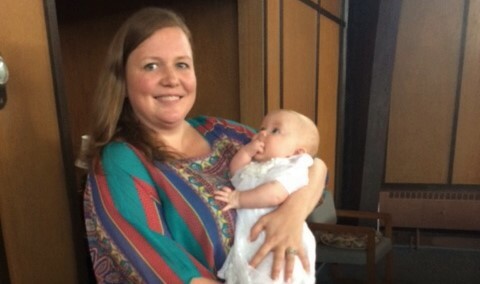 The baptism of baby Mae is an example of handing on the Faith. In the baptismal ceremony the parents and godparents pledge that they will teach and guide the newly baptised in the practice of the Faith. But in my experience it is the grandparents who are the prime movers, encouraging the parents to have the baptism without delay, and then doing all they can to show the child the truths of Faith, and how to put that Faith into practice in daily life. In the baptism of baby Mae, we have an example of many families combining to hand on the Faith over a period of 67 years, and a distance of more than 3,000 miles across land and sea.